We once had a neighbor in base housing who played his giant drum set at all hours in his garage with the door all the way open, creating quite a racket in the adjoining houses. When asked if he could modify his hours or close the garage door, he refused and told us to feel free to call the housing office to complain if we didn't like it. (Hmm…not a stellar way to get along with your neighbors!) Another set of neighbors let their giant dog do its business all over our shared yard. There are just some people you’re glad to say goodbye to when PCS orders arrive! On the other hand, we’ve had amazing neighbors whose children became fast friends of our own, still in touch all these years later, were there to celebrate with us when we brought our newborns home for the first time, and checked on us when my husband was deployed (as we gladly did for them as well). Like anything, life in base housing can be a mixed bag, but if you’re in a location where military housing is the only option or it’s your first time living on base or post, here are a few do’s and don’ts we’ve gathered over the years! DO be a good neighbor. 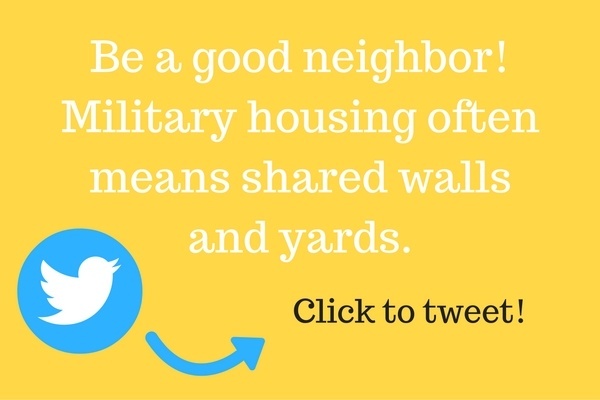 Military housing often means shared walls and yards, so you’ll need to be mindful of your family’s noise and of your neighbors’ privacy. DO be friendly and introduce yourself when you see new neighbors moving in, but DON’T assume because you’re next door neighbors that you need to be best friends. Sometimes a little space can be a good thing! Or who knows? Maybe you DID just meet your new best friend! DO maintain your lawn and keep your quarters reasonably clean. Whether privatized or not, government housing has certain standards you’ll be required to maintain. DO avoid the commissary on pay day if you can! DO take responsibility for your children. Though most military housing has a “Mayberry” vibe and feels safer overall, you’ll need to know curfews and the laws for how old children must be before they can be left alone at home, walking to school, or on the playground. DO observe quiet hours, and try to be mindful of active duty neighbors who are working odd hours and may be sleeping during the day. DO enjoy all the small town perks that seem to go along with most military housing, often within walking distance. Community pools, libraries, bowling alleys, movie theaters, splash parks, rec and youth centers are just a few amenities that can make living on base so family friendly. DO realize that if you want ‘distance’ from your military job, base housing may not be for you. DO make sure to engage with the community off base so you learn more about the area, whether it’s through a community group, church, or other volunteerism. DON’T speed or use your cell phone while driving on base. Too many infractions and you could end up losing your base driving privileges. DON’T let your pets have free roam outside your house. It’s inconsiderate to your neighbors and dangerous for your pet. DON’T forget to check out neighborhood reviews on sites like Military Town Advisor before making the commitment to live on base if you have a choice. Often, insight from others can help you decide what’s best for your family’s situation. And finally…DO enjoy the time you have living in military housing. My grown kids miss the community feel and often talk about their good memories of that time. It can be an amazing experience! So much of what creates a great neighbhorhood situation, whether in military housing or not, is simple consideration and respect. If you’ve lived in military housing, what DO or DON’T would you add to this list?